We are very conveniently situated near state highway 1. Oamaru is ten minutes drive away by car and Dunedin is about 1 ¼ hour drive away. Our holiday cottage is available for self-catering breaks or overnight stay. The cottage stands by itself and has its own deck overlooking the mountains. The bedroom sleeps two persons (twin room). The cottage has a modern heated bathroom with shower.The kitchenette contains a two cooking plate, microwave, fridge/freezer, toaster and all cooking utensils. Oamaru and the Waitaki District offer visitors a wide range of activities including the little blue and yellow eyed penguins, the Oamaru Opera House, the Forrester art gallery, a complete historic precinct, restaurants and shopping, the beaches, lakes and much more. Kakanui Beach is a convenient 10km away and ideal for surfing. The next ski fields can be found in Kurow and Ohau. There are also great hunting and fishing opportunities in our area. Extras: Cleaning after your stay (included); Linen (included); Tea/ Coffee (included); NOTE: Under Kiwi bach tradition you are expected to: Tidy the house and do the dishes before you leave. We live on a farm just outside Oamaru. 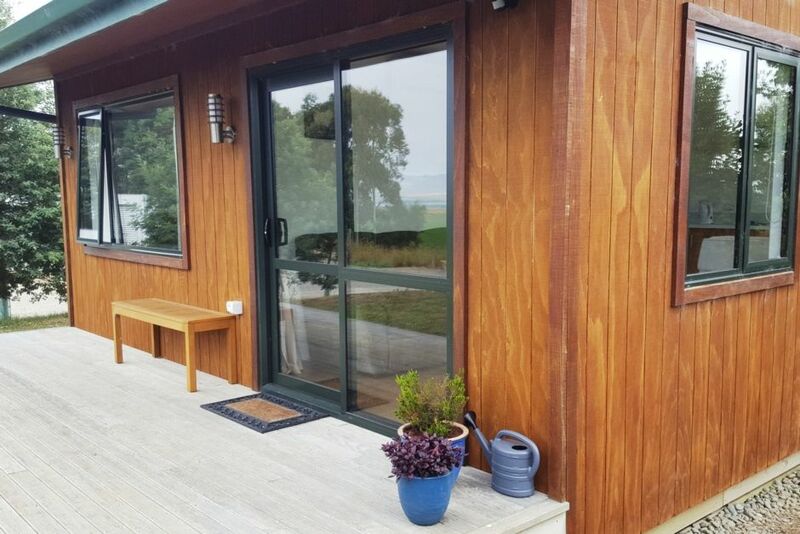 Stay on a NZ working farm with fantastic views, but close to town. A great, clean and comfortable cottage for you to relax. Oamaru is ten minutes drive away by car and Dunedin is about 1 ¼ hour drive away. Very clean, organised, a small nest of tables inside would have been useful. Liz and Marty, however Stef and Ben were very helpful, awesome place , would totally recommend for rest and relaxation. Beautiful place, well looked after farm. Clean comfortable accomodation. Lovely rural views.